Skandicrush, the Scandinavian subscription box! There are a million different monthly subscription boxes out there—ones for dogs, for people with curly hair, for cosmetics junkies, for craft project lovers, and so on. I have never subscribed to one, though. I tend to be slightly (not slightly) picky about what I buy, and surprises (even gifts—I’m horrible) make me nervous. A box full of carefully-chosen Scandinavian stuff, though? Well, it’s tough to go wrong when that task is put in the right hands. 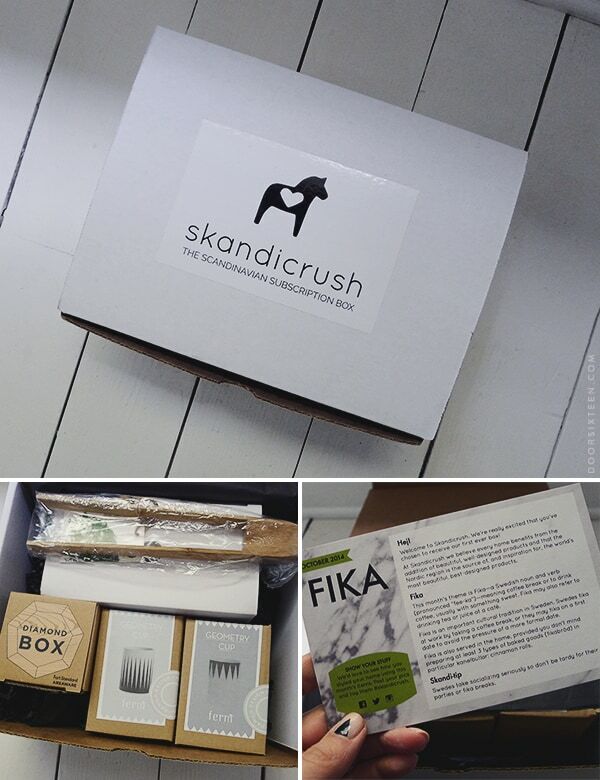 Enter Skandicrush, the Scandinavian subscription box! Ana Denmark (her real name, I swear—and yes, that was the first question I asked her), the founder of Skandicrush, contacted me a while back asking if I’d be interested in reviewing the debut box for the blog. It took me all of 2 minutes spent checking out the sample boxes before replying to Ana with a resounding YES! How could I say no?! And then I waited. Oh, the anticipation! I was so excited when the October box arrived at my office last week—I totally get the whole subscription box thing now. It felt like my birthday! I had to force myself to wait until I got home to open it up so I’d be able to take photos in a setting that didn’t involve fluorescent lights and industrial carpeting. So, what was inside this magical box of fika-themed Scandinavian goodness? All sorts of good things! Wheee!!! SO MUCH PRETTY. The total retail value of everything together is about $90, so the Skandicrush box price—$50/month with an ongoing subscription, $60/month for individual orders*—is quite a good deal. Yes, you’re putting faith in Ana’s ability to assemble a collection of items every month that you’ll love, but judging by this first box and the samples on the site, she really knows what she’s doing. I’ve already signed up for an ongoing subscription, and I’m really excited for my next box! 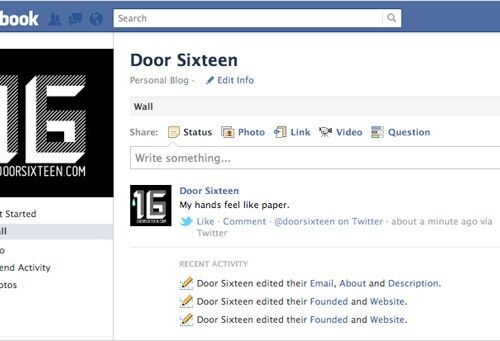 Ana kindly created a discount code for Door Sixteen readers, if you’re interested in subscribing or ordering a box. 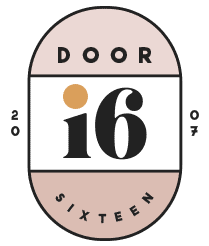 Between now and October 31, you’ll get $15 off your first box when you enter the code D16-OCT at checkout. NOTE: Apparently some folks are getting a DNS or “server not found” error when they try to place an order on the Skandicrush website. If this is happening to you, please contact Skandicrush directly at hello@skandicrush.com so that Ana and her team can get your order taken care of. Sorry for the trouble! 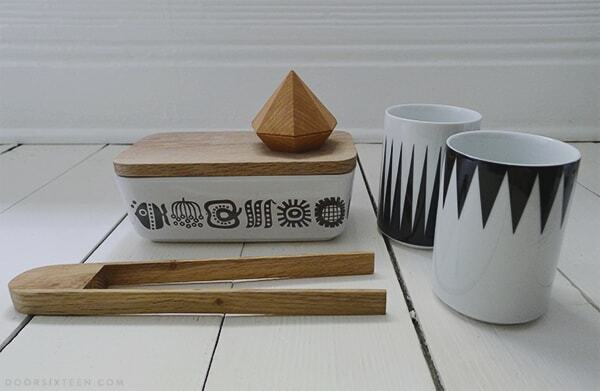 *By the way, Ana just let me know that she’s added an option to order just 2 or 3 boxes at a time, a perfect gift option for a lucky Scandinavian design lover in your life. I haven’t decided what I’ll use the wood-lidded airtight Sagaform storage container for yet, but it’s definitely going in the kitchen. I’m thinking it might be perfect for teabags. The oak tongs look so nice with the container, and they’re just right for yanking bread out of the toaster without burning your fingers or electrocuting yourself. Safety first! Eek! So cute. 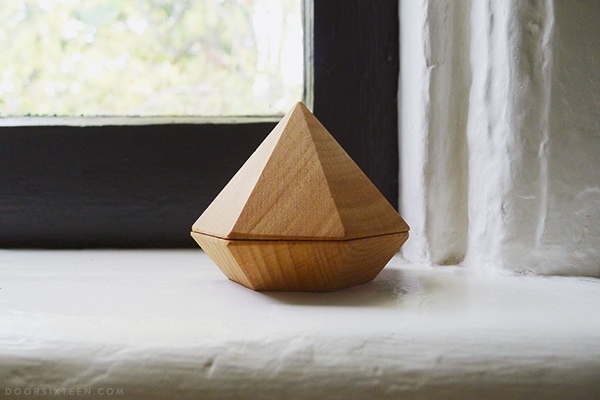 I love love love this little Diamond Box from Areaware. The lid is held in place with two strong magnets, making it a perfect place to hide real diamonds (not that I have any of those—but I have a good imagination) or favorite cookie fortunes. 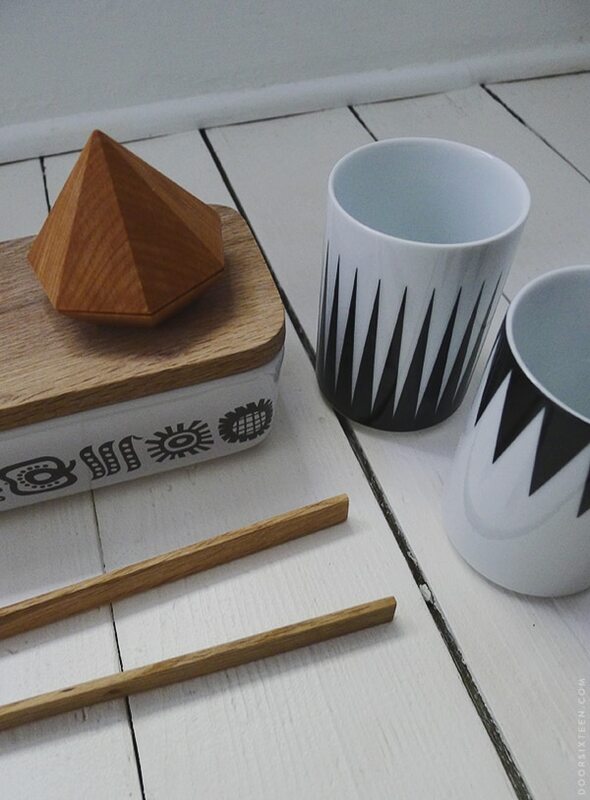 You already know I love these Geometry cups from Ferm Living…obviously. 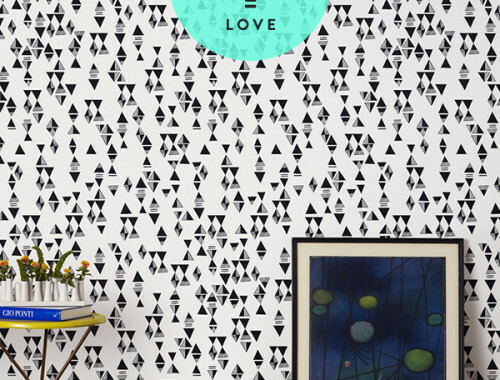 I’ve written about Ferm’s Geometry collection several times, and I’m excited to finally own a couple of pieces! 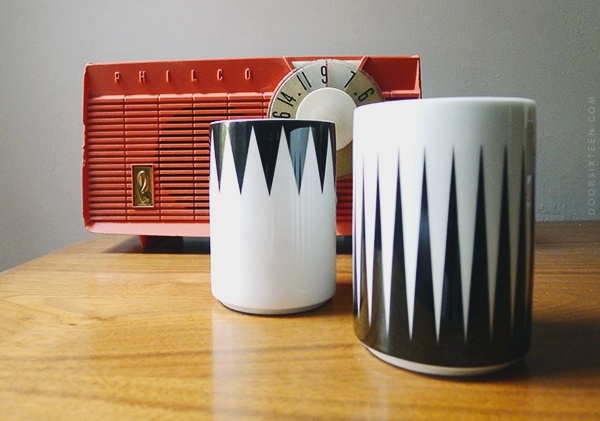 I’m in a bit of a state of mug overload right now, so one of these sweet cups will be used for holding makeup brushes in the bathroom, and the other will probably get to just sit around looking pretty. Thanks so much for giving me the chance to review the first Skandicrush box, Ana! I couldn’t be happier, and I am really looking forward to seeing what’s in the November box. I’m sure it will be beautiful! 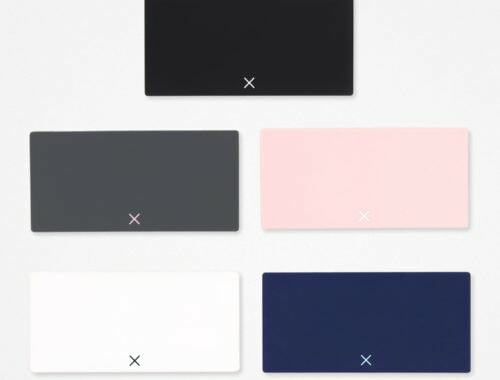 BREAKING: A good-looking pill organizer does exist! 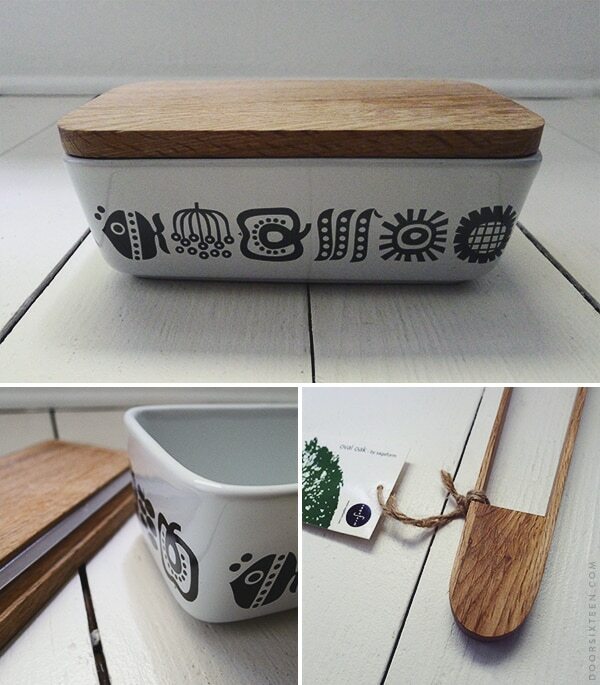 Lisa Congdon for Hygge & West. It’s a little hard to see the dimensions of the Sagaform container, but I think it’s meant for butter. I’m Danish and my mother had containers like this one. You unwrapped the butter, put it in the container and then in the refrigerator. Me too! When I asked, they said they were hoping to start shipping internationally in the next few months. Fingers crossed! I am signing up now wow this is just perfect. I do hove cosmetic subscriptions but this one is to die for. They have to offer this in Europe!!!!! Respect that you were able to wait with opening of the box. I could never do that. I adore Sagaform. This container is usually for butter. Thank you Anna for this review! I LOVE this! Every month having it feel like your birthday – sign me up! 🙂 I’ve tried the Discount Code a few times but it seems to not be working…just wanted to let you know. Thanks! Anne, I’m SO sorry about the discount code! I will email Ana right away to let her know, but please do send an email as well in case your order went through without it. Meant to reply here 🙂 I have not sent an email to Ana. Looking forward to the November box — so exciting! Thanks so much, Anna. This is the coolest sounding subscription box! I used to get Birchbox, but stop after about 6 of them. I found I would rather spend that $10 a month towards beauty products I really wanted. Not some random lipgloss in a color I would never wear. But this! Oh man! I’m so signing up! Thanks, Anna! Anyone else getting a “server not found” message when clicking on the Skandicrush link? Yep, still not working for me. I tried both Firefox and Chrome. This is the best subscription box I’ve ever seen. love it! I’m trying to sign up for it, but keep getting “server not found” message. Thanks, Kali…it’s working fine for me, but I’ll let Ana know that there’s an issue! Ohhhhh boy, I canceled my Julep and Honest Co. boxes (I have such a problem!) in order to sign up for this. Thank you for sharing, I can’t wait to get my first box! I’ve been dying for this post… I LOVE everything. It’s so hard for me to spend money when I don’t know what I’m getting for it, but I’m sold. Oh yes PLEASE! I hope they ship to Australia soon! Love love love. I signed up for it as soon as I read about it on your Facebook page and got my box one day after you. I loved everything, but I’m specially in love with the diamond box! So so cute! Update: The November box has sold out. You can still order online, but your subscription will start with the December box. We’ve read all your comments so far. Hopefully, the DNS errors have worked themselves out by now — please reach out to us (hello@skandicrush.com) if you are still having issues with the site– or just to say hello. We are working on a cost-effective international shipping solution. So far we’ve heard those of you in Canada, UK, Australia, Germany, South Africa and Saudi Arabia. Our current goal is to offer shipping to Canada starting in January. But we hope to reach all of you soon! I saw this box reviewed on other blog (focusing on subscription boxes) and immediately thought of you. Glad you were clued in on it! 🙂 The little storage box is so cute. Alas, I cannot afford another sub as I already have 4. That’s enough! I won the soap giveaway (YAY!) and wanted to say Thank you! It is my first time winning something! Oh my word! I love everything about this! I was so super excited! waiting for my payday to sign up for this incredible box…. I mean everything looks so lovely, I never seen a subscription box with such a quality level… but I guess I’ll have to wait for the International shipping… UK wants some skandicrush too!!!! Just discovered SC too while researching! Why are all the good ones far away!! Even the UK has killer design/decor ones. Wanted to let you know Decoterie just launched too, definitely give them a peek! I work there 🙂 Will email you a preview! Oh my gosh! I just found your blog a week ago, so I know this is an old post but I am totally subscribing to Skandicrush! I tried one other subscription box service before, but unsubscribed after 5 or 6 boxes. These look much more up my alley!